Monica Weber Mazzola is an associate attorney with ROLF and focuses her practice on employment law and business litigation. She advises employers on day-to-day human resources issues, including hiring, discipline, termination, ADA & FMLA compliance, and harassment investigations. She conducts supervisory training, prepares employment contracts, and drafts employee handbooks. Monica also defends employers’ rights before state and federal courts and government agencies in employment and business litigation. U.S. District Court for the Northern District of Ohio. 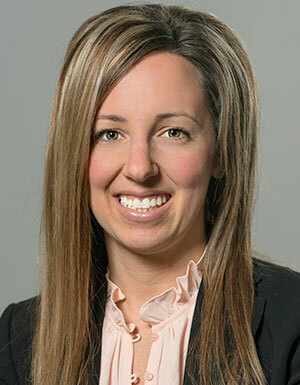 Monica has been named as a “Rising Star” in the area of labor and employment law in 2009 and 2011 by Ohio Super Lawyers – Rising Stars Edition. Monica previously served as the Vice Chairperson on the Board of Directors of Cornerstone of Hope, a non-profit organization dedicated to providing hope, education, and support to grieving children, teens, and adults.